A intelligence memo is photographed in Washington, Friday, Feb. 2, 2018. U.S. President Donald Trump is contending that a controversial memo alleging that the FBI abused its power in probing Russian interference in the 2016 presidential election "totally vindicates" him, but that view was challenged Sunday by one of the memo's own authors. Trump complained in a Saturday Twitter comment that the "Russian Witch Hunt goes on and on. Their was no Collusion and there was no Obstruction (the word now used because, after one year of looking endlessly and finding NOTHING, collusion is dead). This is an American disgrace!" 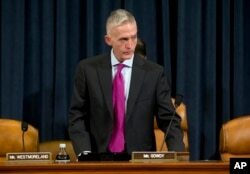 But Congressman Trey Gowdy of South Carolina, one of the key authors of the Republican memo released by the House Intelligence Committee, told CBS's "Face the Nation" on Sunday that the document does not undermine the months-long investigation by special counsel Robert Mueller into the Russian campaign meddling or whether Trump obstructed justice in trying to curb the probe. The four-page "Nunes memo," named after the House Intelligence panel chairman, Congressman Devin Nunes of California, concluded that the Federal Bureau of Investigation relied excessively on opposition research funded by Democrats in a dossier compiled by a former British spy, Christopher Steele, as its sought approval from a U.S. surveillance court in October 2016 to monitor Carter Page, a Trump campaign adviser, and his links to Russia. Rep. Devin Nunes, R-Calif., attends a speech by President Donald Trump at the 2018 House and Senate Republican Member Conference at The Greenbrier, in White Sulphur Springs, West Virginia, Feb. 1, 2018. But the memo notes that the FBI investigation that eventually led to Mueller's probe started months earlier, in July 2016, when agents began looking into contacts between another Trump adviser, George Papadopoulos, and Russian operatives. Papadopoulos, as part of Mueller's probe, has pleaded guilty to lying to investigators about his Russian contacts and, pending his sentencing, is cooperating with Mueller's investigation. Gowdy said in the television interview that "there is a Russia investigation without a [Steele] dossier" because of other Trump campaign links to Russia, including a June 2016 meeting at Trump Tower in New York set up by Trump's eldest son, Donald Trump Jr., on the premise that a Russian lawyer would hand over incriminating evidence on Trump's election opponent, Democrat Hillary Clinton. Gowdy said the Steele dossier "also doesn't have anything to do with obstruction of justice." Another Republican on the Intelligence panel, Congressman Chris Stewart of Utah, told Fox News, "I think it would be a mistake for anyone to suggest the special counsel should not continue his work. This memo, frankly, has nothing to do at all with the special counsel." Democratic lawmakers opposed to Friday's release of the memo say that as soon as Monday they will seek the Intelligence committee's approval to release their counter interpretation of the classified information underlying the Nunes document. The Democrats contend that the Republican-approved statement "cherry-picks" information and overstates the importance of the Steele dossier in the FBI's effort to win approval from the Federal Intelligence Surveillance Court for the monitoring of Page's activities. Democratic Congressman Jerrold Nadler of New York said the memo released by the Republicans "is a disgrace. House Republicans should be ashamed." Senate Democratic leader Charles Schumer, in a letter Sunday, pushed Trump to approve release of the Democratic response to the Nunes memo, saying Americans should "be allowed to see both sides of the argument and make their own judgments." Ahead of Trump's approval of release of the Republican-backed House Intelligence panel's memo, the FBI said it had "grave concerns" about its accuracy because of omissions concerning its request to the surveillance court to monitor Page. Deputy Attorney General Rod Rosenstein, who is overseeing the Mueller investigation, also opposed its release. Deputy Attorney General Rod Rosenstein speaks before a House Committee on the Judiciary oversight hearing on Capitol Hill, Dec. 13, 2017. 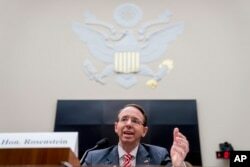 Rosenstein was one of several Justice Department officials who signed off on the request to the surveillance court to monitor Page, leaving some Trump critics to voice fears that Trump would soon fire Rosenstein. Later, however, White House spokesman Raj Shah, said on Fox News, "Rod Rosenstein's job is not on the line. We expect him to continue his job as deputy attorney general." The FBI noted it was given “limited opportunity” to review the document before lawmakers voted to release it. “As expressed during our initial review, we have grave concerns about material omissions of fact that fundamentally impact the memo’s accuracy,” the agency said. 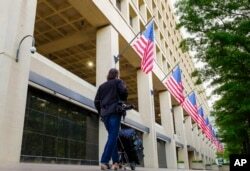 FILE - A member of the news media walks in front of the FBI headquarters building early in the morning in Washington, May 10, 2017. Attorney General Jeff Sessions weighed in on the memo’s release Friday, saying, he has "great confidence in the men and women of this Department [of Justice]. But no department is perfect." FBI Director Christopher Wray, who was appointed by Trump, told agency employees Friday that he stood with them. "I stand by our shared determination to do our work independently and by the book," Wray said in a statement to 35,000 FBI staff.